IN THIS ONE... Mr. Freeze vs. Grant Walker: Second engagement! REVIEW: Remember Grant Walker from "Deep Freeze"? He was the Walt Disney stand-in with the giant theme park/eugenics colony that wound up on the wrong end of Mr. Freeze's cold technology and was last seen trapped in an iceberg, granted ironic immortality. So he's back and he wants the current cryogenics expert to help him. Except that expert is Nora Fries' new husband, Dr. Francis D'Anjou (she has a very specific type). Freeze, fished out of the bay and kept as a living, talking head, cares for nothing EXCEPT Nora's happiness, and when he volunteers to help rescue him in earnest. 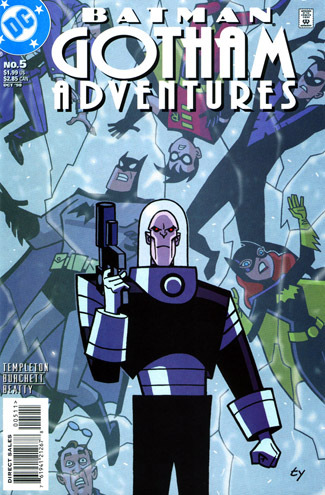 By the end, when it goes a little pear-shaped and the Bat Family have to keep Freeze from killing Walker, and D'Anjou lets him escape, the two men best mirror each other. They are at each other's service exactly because Nora loves them (in Victor's case, yes, still). That's the real success of Ty Templeton's Batman stories for this title: Their emotional resonance. He cares for these characters, even the villains, and makes us care. It's more emotionally adult than the series has become, and the comics may end up being more satisfying than the show's episodes during the same era. We'll see. The art in this case, while good, isn't as clear in its action. Fights are chaotic and dirty. The one place it really works is when Walker freezes Bruce Wayne's head and Tim desperately tries to break the ice open before he chokes. Harrowing! REREADABILITY: Medium-High - Gets to the core of Mr. Freeze's limited emotional depth, making for a strong second engagement with the New Adventures version of the villain.